Rewind makes me want to consume! The shop is filled with beautiful objects which are made in an ecologically responsible way. Not ecological in a hippie way at all, here eco is the new design. How about a bath cap transformed into a toiletry bag, an old book into a coat rack or used truck tarps into a wallet? Points for originality when you give someone a present from Rewind. Every few months I visit Rewind to check if new things have arrived, not always to buy because design is mostly a bit too expensive for me. Luckily, the owners don’t mind customers just checking the stuff without buying anything. If I had the money, my apartment would be filled up with furniture, lighting and interior gadgets from Rewind. 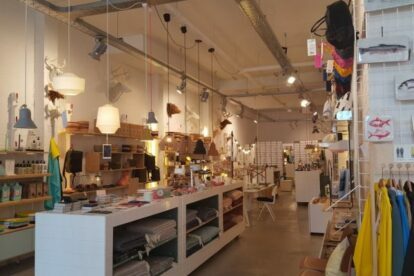 The second shop ‘PLAY!’ is the kids’ division and is located in Kloosterstraat. Like all the vintage and antique shops there, both shops are open on Sunday. And even better, they are open on public holidays too.